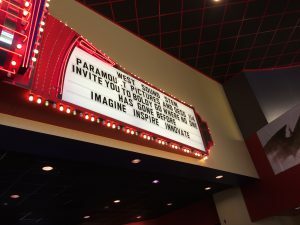 That’s because Kareen called me with news that she had the fortune of working with Kim Mays (General Manager, Galaxy Theatres Uptown Gig Harbor) who worked with Paramount Pictures to secure a pre-release screening of Star Trek Beyond for a group of hard working West Sound STEM education professionals. Galaxy Theatres is well known for their innovative use of theatre to serve the community. So, in mid-July, I pointed my starship (okay, my 2007 Honda Fit) down to Gig Harbor for the West Sound STEM Network gathering “Imagine, Inspire, Innovate: Equipping the Next Generation of Explorers.” We heard from amazing STEM professionals, elected officials, educators, and researchers exploring the “final frontier” of STEM education. We even learned that Congressman Derek Kilmer considers himself the biggest sci-fi geek in Congress. And it turns out there’s some parallels between the West Sound STEM Network and Star Trek. As the Borg say – Resistance (to the need to become STEM literate in our society) is futile. STEM is involved in everything we do – from checking our text messages to driving our cars to eating apples to catching salmon. And thankfully, Next Generation Science Standards, as implemented by our educators, make STEM education “interactive, project-oriented, and fun. And fun wins the battle of engaging kids.” Randy Dorn, our state superintendent, said that during the event, and we think he’s right. During the event, we heard from classroom teachers Candace Barich and Al Gonzalez about their experience teaching STEM education in the classroom. They shared what worked, what didn’t, and what they were excited to do next. This mind meld might not have been quite the way Spock would have done it, but sharing ideas, classroom best practices, and teaching strategies are an invaluable part of bringing teachers together. Maybe what makes West Sound STEM Network a bit different than Star Trek is that there’s no “red shirts” – no expendable members of the team. The West Sound STEM Network works across Networks to get high-quality STEM education and opportunities to students, and everyone plays a role. That’s why when OESD 114 Superintendent Greg Lynch spoke, he had over 39 partner organizations displayed behind him – it truly takes all these partners to create a next level education. A high-quality STEM education is our pathway to “live long and prosper.” Want to know more about the West Sound STEM Network? Check out their website – http://www.westsoundstem.org/! And special thanks to Galaxy Theatres and CEO Frank Rimkus for their partnership and hospitality.